Lawn Manager Pro is used by Lawn Service companies both large and small. It provides the means to keep current with schedules, customers, billing, etc. It's hard to stay organized in a small business, where everybody has a lot of hats to wear, and where customers expect your immediate reaction to their needs. If you don't do it, they are off to your competition. Managing a lawn service business requires a product like Lawn Manager Pro. Complete Lawn Service Management and Billing. ...... Managing any service company, you'll need to track customer's, schedule services, watch the payments, and much more. Lawn services are very personal. Building a good business relationship with your clients will be an important part of your business. 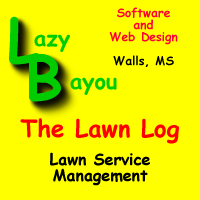 Lawn Manager Pro software will help you present a professional appearance to your customers. Lawn care contractors around the globe use Lawn Manager Pro software to boost productivity, manage all property and job information, present a more professional appearance, and, ultimately, increase profits. Internet cafe software for cyber cafe management. Secure client access system. Web-based software to manage customer, project and task lists online. Program for accounting projects, tasks, cliens and actions of executors. Handy manager that lets you automate launching many tasks with one click! Qweas is providing links to Lawn Manager Pro 4.0.0 as a courtesy, and makes no representations regarding Lawn Manager Pro or any other applications or any information related thereto. Any questions, complaints or claims regarding this application Lawn Manager Pro 4.0.0 must be directed to the appropriate software vendor. You may click the publisher link of Lawn Manager Pro on the top of this page to get more details about the vendor.